Earlier today Art Rooney II and the Pittsburgh Steelers hosted NHL Commissioner Gary Bettman and member of the Penguins and Capitals to unveil some details regarding the NHL's Crown Jewel to be played on January 1. 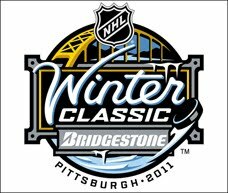 The fourth installment of the Winter Classic, to be played at the sparkling home of the Steelers, will feature the hometown Penguins hosting the Washington Capitals in a marquee matchup that will pit the game's two biggest stars -- Pittsburgh's Sidney Crosby and Washington's Alex Ovechkin -- against each other before a national television audience in a game broadcast by NBC in the United States and CBC in Canada. Visit NHL.com for details on surrounding events, videos and to register for info on the Winter Classic including tickets! If you watch the videos, you will see Bettman's announcements, interviews with Bettman, Mario Lemieux, George McPhee and of course, Sid the Kid. Also, there is footage of a very awkward shooting competition, featuring the players in attendance trying to shoot the puck off a ramped surface through the Heinz Field goalposts! What? What you won't see there is any evidence of attention whore and quote machine Max Talbot, talking about why he hates Ovechkin, and then refers to him as: "a real douche"... but you can here! Major props to Yahoo! 's Puck Daddy for the heads up. As if this game needed more hype! Thanks Max! We were lucky enough to attend the 2010 Classic at Fenway. The event is spectacular and worth any effort to get there. We will see you in Pittsburgh on New Years' Day!